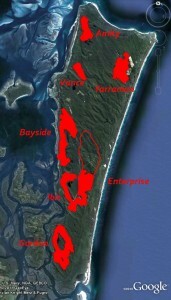 There are three areas which are currently being mined, and three areas which have been mined out. 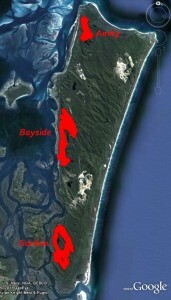 These mines, Gordon, Bayside and Amity, are shown in the picture on the right. The mining company, Sibelco (formerly Unimin), has responsibility for revegetating these mines. When current and completed mines are overlayed on a satellite image of Straddie, it is clear how much of the island the mining company wants to mine. See image below.